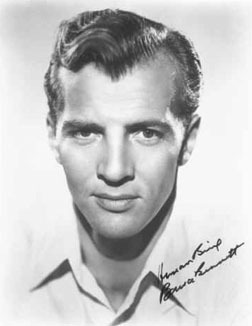 Bruce Bennett was Edgar Rice Burroughs' choice to play Tarzan. He appeared in more than a hundred films, dating back to the early years of talkies. For much of his career, he was credited under his birth name, Herman Brix, and he won a silver medal in the Los Angeles Olympics of 1932. As a teenager, he worked as a lumberjack. He lettered in track and field and varsity football at the University of Washington, including a 1926 trip to the Rose Bowl, where he played all 60 minutes but the Huskies lost to Alabama 20-19. Johnny Mack Brown, another athlete who crossed into film, played in the same game, for Alabama's Crimson Tide. After college, Brix came to Los Angeles, where he worked behind the scenes in silent films but yearned to be in front of the camera. He auditioned for MGM's big budget Tarzan the Ape Man, and was considered a frontrunner for the role, but lost the part after suffering a shoulder separation while playing a football player in another film, Touchdown. It was a lucky break for Johnny Weissmuller, but Burroughs, Tarzan's creator, did not like the changes MGM made to his plot and characters, and decided to produce Tarzan serials himself. When he did, he chose Brix for the role. In those days, the studios used action-packed cliffhanging serials to lure audiences to the movies, with a new episode every week running before the feature film. Brix became a star in these serials, starting with The New Adventures of Tarzan. His performance as Tarzan remains the only film presentation that was generally true to Burroughs' novels, with the Ape Man portrayed as the sophisticated English nobleman the author envisioned, and speaking in full, flourished sentences, not monosyllabic grunts. The Tarzan serials, later repackaged as feature films, were very popular in foreign markets, but their distribution in America was suppressed by MGM, which was still producing Weismuller Tarzan films. In other serials, Brix thwarted the evil Bela Lugosi's dastardly plot in Shadow of Chinatown, battled the dreaded Yellow Weasel in Hawk of the Wilderness (easily Brix's best work), and defeated The Lightning -- George Lucas's acknowledged inspiration for Darth Vader -- in The Fighting Devil Dogs. As Hollywood developed and serials came to be seen as less prestigious -- similar, perhaps, to TV today -- Brix changed his name to the more "normal" sounding "Bruce Bennett" and tried to distance himself from serials. He worked steadily as an actor, if rarely a star, for decades. He played Joan Crawford's wayward husband in Mildred Pierce, played sidekick to Humphrey Bogart in Sahara, he was the hungry prospector who wolfed down Bogey's stew in John Huston's masterpiece Treasure of the Sierra Madre, and he was an aging baseball player in the original Angels in the Outfield. For 1961's low-budget Fiend of Dope Island, Bennett himself wrote the screenplay and played the title role, a marijuana farmer and brutal gun smuggler. By the 1970s, Bennett had mostly retired from show business and began working in real estate and investing in vending machines, soon earning more money than he had ever made in movies. At age 95, he delivered a pre-game pep talk to his alma mater's Huskies before the 2001 Rose Bowl, a 34-24 victory over Purdue. Complications from a broken hip.